Students studied in Mexico, the United Kingdom, Spain, Italy, Japan and China – where will your education take you? “Ciao,” “hola,” “cheerio” and “konnichiwa” are just a few of the greetings that dozens of JCCC students used as they crossed the globe this spring and summer as part of the College’s Study Abroad programs. A team of 13 students, overseen by Dan Eberle, installed solar electric and hot water systems in Las Pintas, Mexico, at the end of May. Helene Perriguey-Keene also worked with the students as they learned more about the culture of Western and Central Mexico. 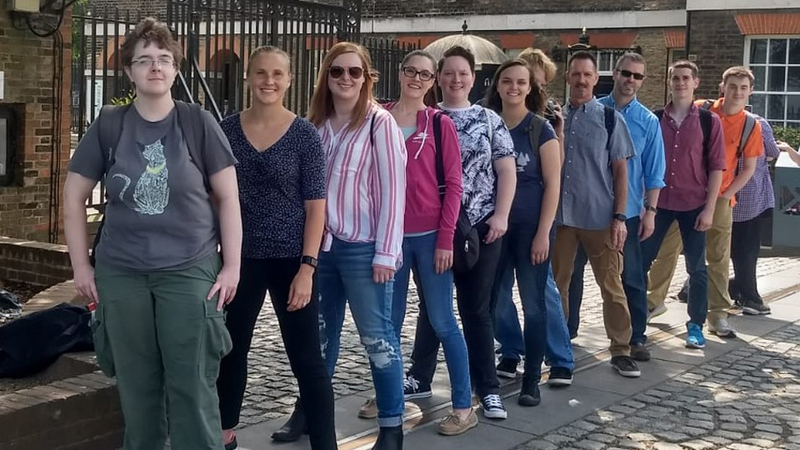 Nine students, led by John Harty and Marie Paxton Staniforth, spent a week in London and Edinburgh, Scotland, examining globalization and nationalism. In May, 14 students joined Robert Dye and William Stockton to immerse themselves in the classical art and architecture of Italy. For two weeks, eight students, led by Tatiana Scanlan and International Education Coordinator Ivee Baugh, studied the Russian language and culture halfway around the globe. A dozen students also took time to learn about cultures around the world in monthlong individual study programs. Jo Holland, Emily Worth and Sierra Voorhies delved into the Spanish language in Seville, Spain, over the month of June. Also during June, Celeste Buchanan increased her culinary skills and Monica Curiel studied art and architecture at the Florence University of the Arts in Italy. Curiel, Holland and Worth each received the prestigious Benjamin Gilman International Scholarship from the U.S. Department of State to help offset their international study expenses. Jonathan Rabanal and Alivia Crouch will return to JCCC in August after nearly five months in Japan. Rabanal also was awarded a Benjamin Gilman International Scholarship, as well as a Benjamin Gilman Critical Need Language Award and a Freeman-Asia Award for Study in Asia. And five more students – Anthony Arling, Teagan Hosford, Kate Larberg, Jackson Martin and Raven Peer – completed a semester in Xi’an, China, this past spring. Faculty-led Study Abroad programs are usually one credit hour, with students graded by faculty. Most students pay for their trip by saving money, applying for and receiving scholarships, and seeking financial aid. Some JCCC departments provide supplemental funding to keep costs down for faculty-led trips. Baugh said there’s nothing like quickly adapting to a new culture when you’re in a country where you don’t speak the language. And in the words of one student who went to Italy, the trip of a lifetime was an experience that will impact the rest of her life. If you’re interested in learning more about a study abroad trip or semester, stop by the International Education Office in COM 220 or email the department with questions. The fall trips are full, but there are opportunities for spring and summer travel in 2019. Then, get a passport and start saving your money. The application deadline is usually Oct. 15 for spring study abroad programs and March 15 for summer and fall programs.